Knopf Publishing Group, 9780307593283, 359pp. Matthew Guerrieri is a music critic for "The Boston Globe," and his articles have also appeared in "Vanity Fair," "NewMusicBox," "Playbill," and "Slate." He is responsible for the popular classical music blog Soho the Dog (sohothedog.blogspot.com). He lives in Framingham, Massachusetts. "Matthew Guerrieri is a brilliant, impassioned, and witty observer not only of music but of the entire cultural landscape surrounding the art. 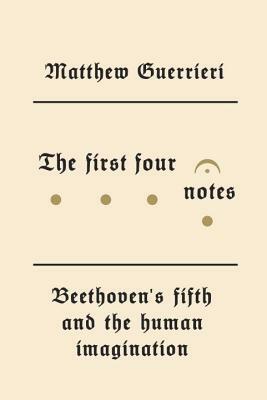 A bit like Beethoven himself, Guerrieri finds a cosmos in four notes." "Music’s most memorable da-da-da-dummm touched off a cultural and intellectual ferment that’s ably explored in this sparkling study. Boston Globe music critic Guerrieri opens with an engaging musicological investigation of how Ludwig van Beethoven orchestrated his Fifth Symphony’s urgent rhythms and unsettling harmonies into a work of unique emotional and rhetorical force. . . . Guerrieri often wanders away from Beethoven for luxuriant digressions on German romanticism or Victorian patent laxatives, but clothes his erudition in lucid, breezy prose. He makes the muzziest musico-philosophical conceits accessible and relevant, while tossing off his own intriguing insights—'Beethoven’s heroic music is a lot like Steve McQueen’s acting'—with the flick of a baton. The result is a fresh, stimulating interpretation that shows how provocative the familiar classic can be."